"Why not? Definitely, 100 percent. Everything depends on the script - we all keep working hard, but if we don't like the story, it becomes a bit difficult. I would be eager to do it because it will be so beautiful." 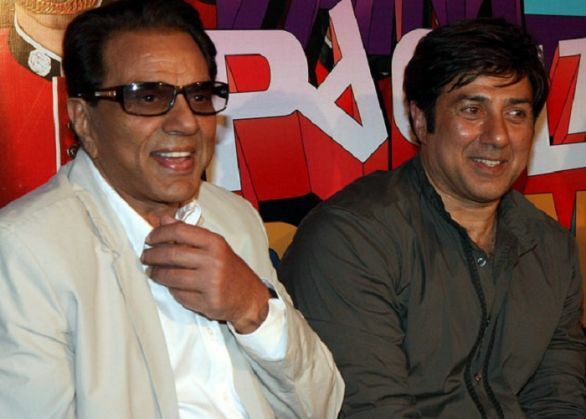 Sunny said that a film like Apne would be more apt for such a cast than a comedy entertainer like Yamla Pagla Deewana - both of which starred Dharmendra with both his sons Sunny and Bobby. "Okay, if not a Yamla Pagla Deewana, then an Apne type of a film. We will do that... we need to make corrections in life". By 'corrections', Sunny was perhaps talking about the lukewarm response to the sequel of Yamla Pagla Deewana. Sunny also ruled out the possibility of a cameo by either Dharmendra or Karan in his forthcoming film Ghayal Once Again. "We don't give tips to anyone. He has grown up in the house with all of us, so he has definitely grown up knowing what has to be done and not to be done. Sunny also handed out a few tips on parenting. "As a father, we give our full effort to support them (children) in whatever they wish to do. My guidance to him has always been, 'Do what you want to do and not what I want you to do because I did what I wanted to do and that's the way life should be". Ghayal Once Again releases on 5 February. Cheap & toxic khesari dal: is this govt's solution to India's pulse problem? READ NEXT >> Cheap & toxic khesari dal: is this govt's solution to India's pulse problem?